GCV33 3.3 Oit. C5-E8. Lâminas: Alumínio 31,5 mm. Afinação A: 442 Hz. Frame: Voyager. Largura: 120 cm. Topo Grave: 56 cm. Topo Agudo: 31 cm. Altura Ajustável: 80-100 cm. The Adams Artist and Concert Series Round Top Parsifal Bells are made of high quality steel that have been custom formulated especially for Adams. The bells exactly match the specifications of the 'ground top Deagan Parsifal bells' which many international musicians feel set the standard for quality and sound. Adams has designed the new bells with the right timbre, resonance and tone that match the characteristics of the 1920'fs American sound. The Artist Series GAT33 and GAF33 feature a 3.3 octave (C-E) range including a reversible damper pedal, Nickel Plated Steel resonators and Adams' Patented Height Adjustable Voyager or Field Frame. "The new Adams Artist Model Glock has opened up a whole new world of musical possibilities for the orchestral glockenspiel. Finally, somebody has combined the best attributes of vintage bells with "state of the art" features. 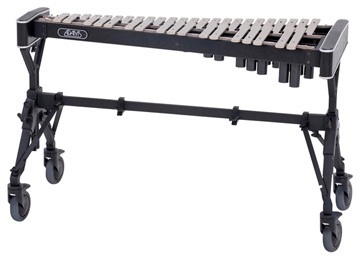 This instrument is the perfect combination of top quality, great-sounding steel bars with resonators, an extended range, reversible damper pedal system all on a height adjustable frame. Its sound is comparable to my Deagan Roundtops, but easier to play. The extended range means no more octave shifts! The reversible damper pedal allows for some interesting new approaches to the standard bell repertoire. This feature is especially helpful when performing parts intended originally for keyboard Glock. (Messiaen, Dukas) It's the instrument of choice, whether your an established pro or just starting out." Sam Bacco - Nashville Symphony Orchestra, Nashville Recording Studios. (All with steel bars, includes cover and mallets). "I’ve successfully received my new marimba, xylo and glock and have to make a point of saying that they are world class. I am extremely pumped up. In particular, the glock is like a Ferrari, just miles and leagues ahead of any other glock out there. No contest. It is the one instrument I purchased sight-unseen, and it is totally outrageous. Amazing". Matthew Duvall-Eighth Blackbird. "The big Adams glock is an ideal instrument for the kind of music I am playing with NExUS. The unique quality of sound is reminiscent of the classic instruments of a bi-gone day which I believe has to do with the range, metal, tuning, and resonators. The addition of the damper mechanism allows me to phrase with the vibraphone in ways previously impossible. If Mozart were alive, he'd call it the "Magic Glock". Garry Kvistad-NExUS.